Last week, Jon was honored at Ivy Tech Community College-Northeast’s Chancellor’s Scholarship Dinner, and I had the honor of tagging along. The evening was inspirational, as previous scholarship winners spoke about how the award had helped them achieve their dreams. Since we made the decision to send Jon to school, finances have been tight, and the scholarship he received will go a long way to help us cover the cost of school, while also paying our bills. Thank you Ivy Tech Foundation for helping us move closer to our goals. 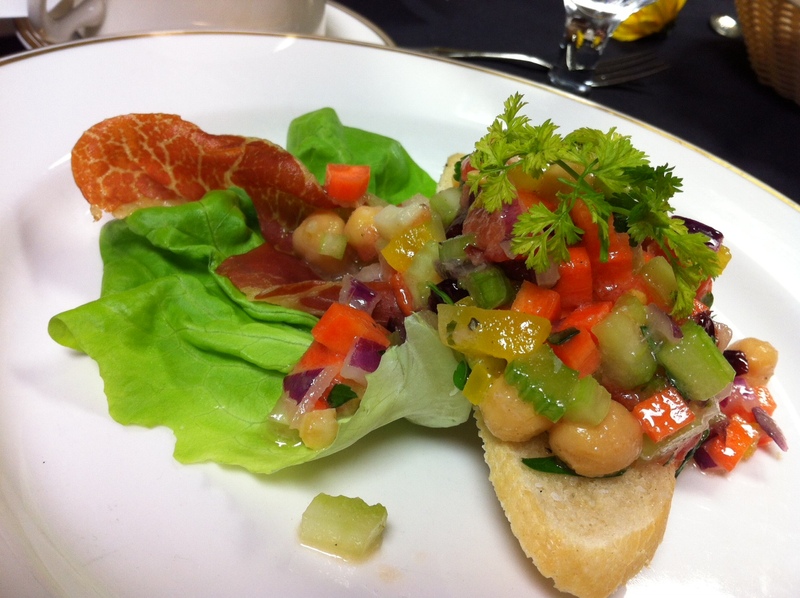 And thank you Ivy Tech for the wonderful dinner, which was prepared by a handful of Hospitality students. 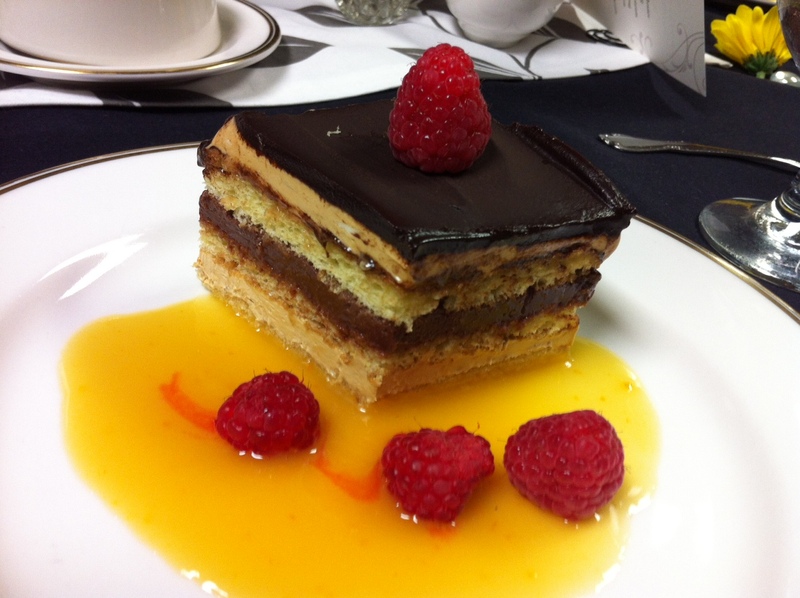 Almond sponge cake layered with espresso butter cream, chocolate-raspberry ganache and imported dark chocolate. Finished with orange coulis and fresh raspberries. I consider myself a food snob. I am a harsh critic. This food was outstanding. 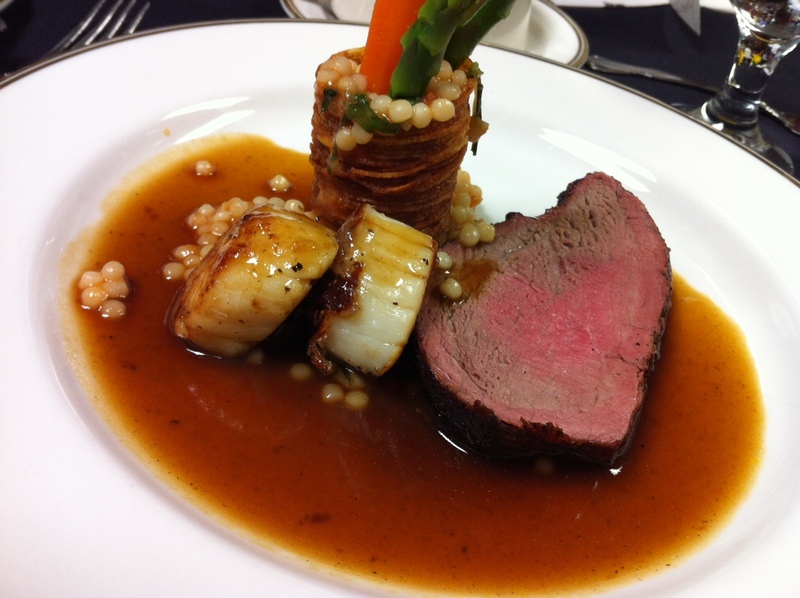 Each course was packed with complex flavors. By the time we got to dessert, I was full, but I managed to eat the delectable dessert- packed full of intensity. Here’s the best part: The Hospitality department hosts weekly “Special Cuisine Dinners,” each with a different theme, providing the students the opportunity to prepare food for the public and the public the opportunity to try unique cuisine. The next one is Thursday, April 5, at 5:30 in the Hospitality Room on the Coliseum Campus (3800 North Anthony). The theme is Russia, and the cost is $20 per person. For more information and a full schedule, visit the hospitality website. We intend to attend as many of these as possible.